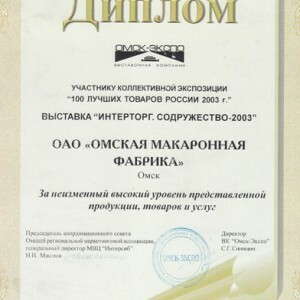 LAUREATE title of the All-Russian Competition “100 best products of Russia” for alimentary products “DOBRODEYA”. 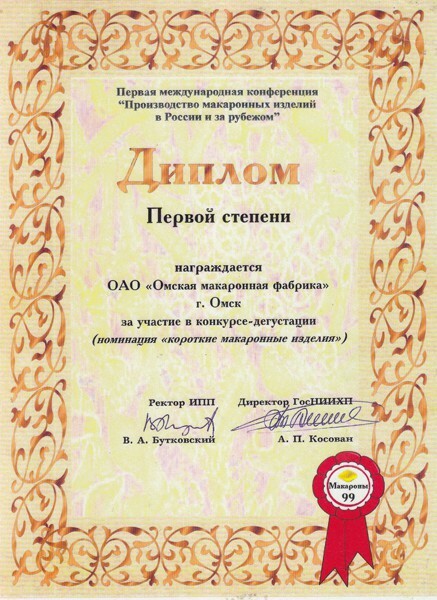 GREAT GOLD MEDAL at the International Exhibition “Prodsib-2002” for the excellent quality of alimentary products and quick-cooking noodles, Novosibirsk. 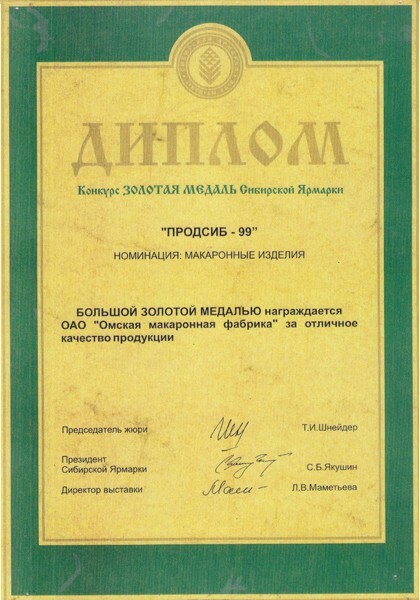 Gold medal of the competition “Best alimentary products” at the specialized exhibition “GROCERY BUSINESS 2005” for the high quality of the short-cut alimentary products “Dobrodeya”, for stable quality and wide range of products, Moscow. 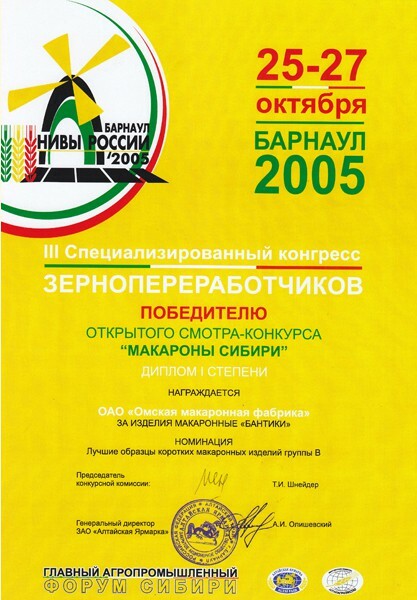 SILVER MEDAL at the Eighth Russian Agro-Industrial Exhibition «Golden Autumn» for the low-calorie spaghetti “Dobrodeya for Health” made from the second-grade strong white flour. 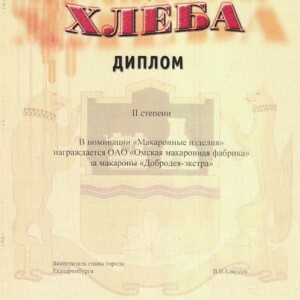 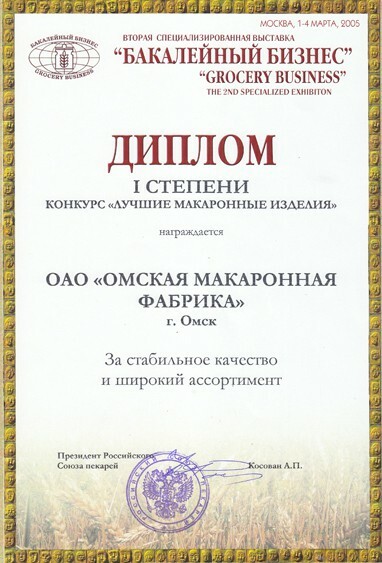 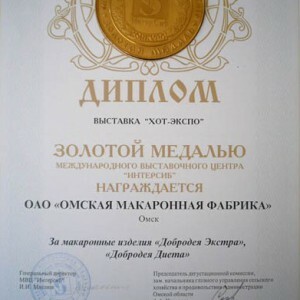 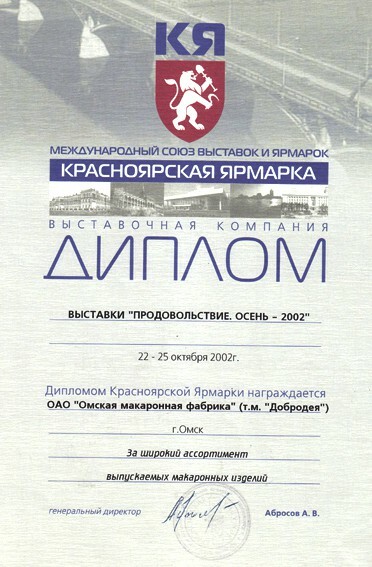 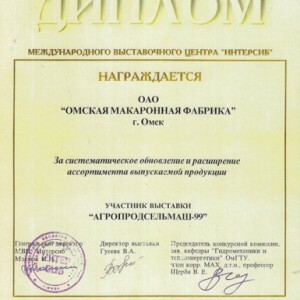 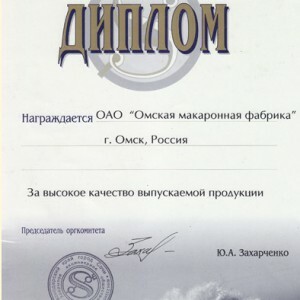 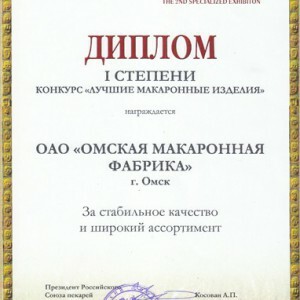 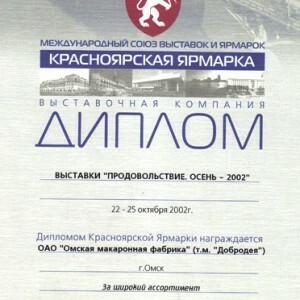 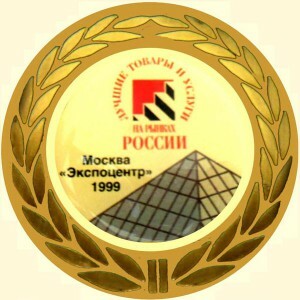 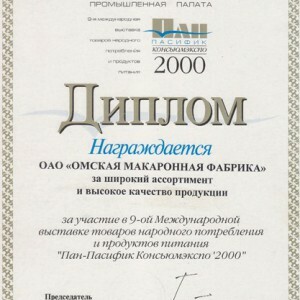 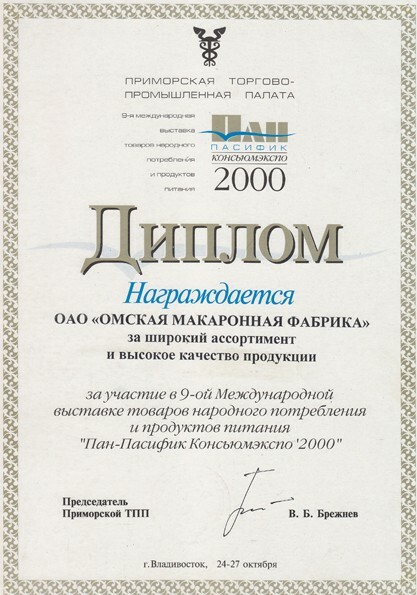 LAUREATE title at the exhibition “Omsk trademark”. 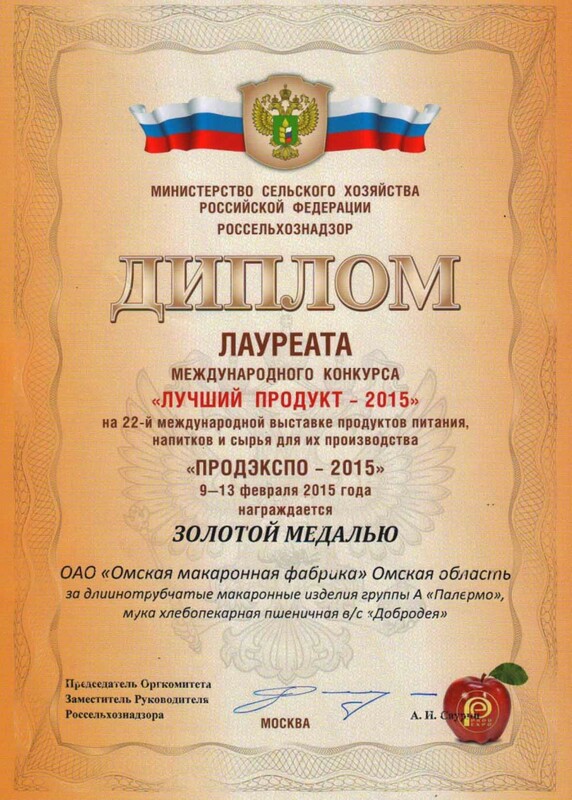 GOLD MEDAL at the Ninth Russian Agro-industrial Exhibition “Golden Autumn” for alimentary products “Mafalde” and “Farfalle”, Moscow. 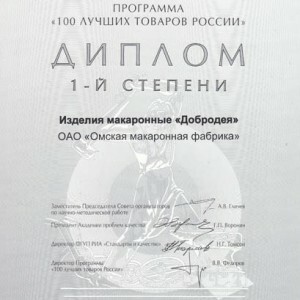 LAUREATE title at the All-Russian Competition «100 best products of Russia» for macaroni, vermicelli and macaroni specialties “DOBRODEYA”. 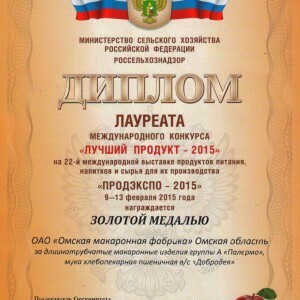 DIPLOMA at the Siberian Agro-Industrial Week for active promotion of DOBRODEYA pasta in the Omsk region. 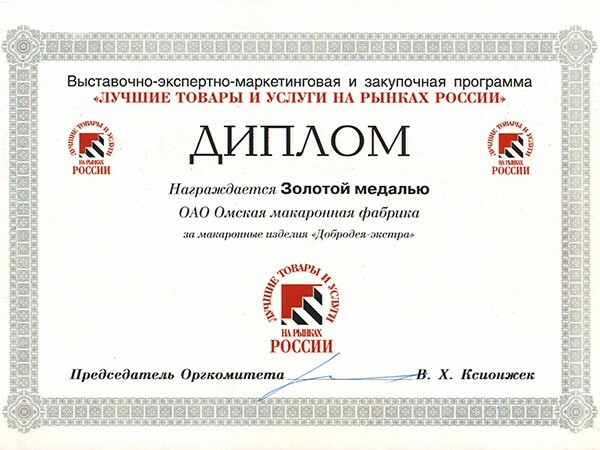 First place diploma for the long alimentary products “Palermo” at the International Review of Alimentary Product Quality, Moscow. 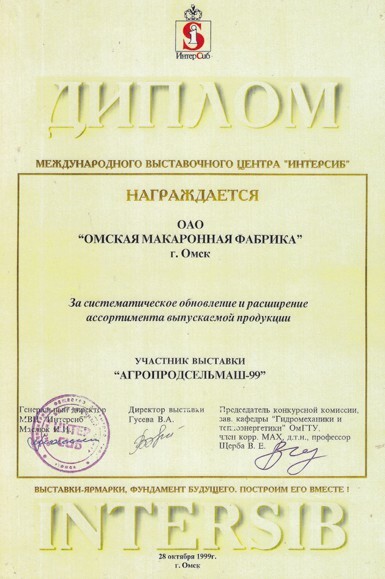 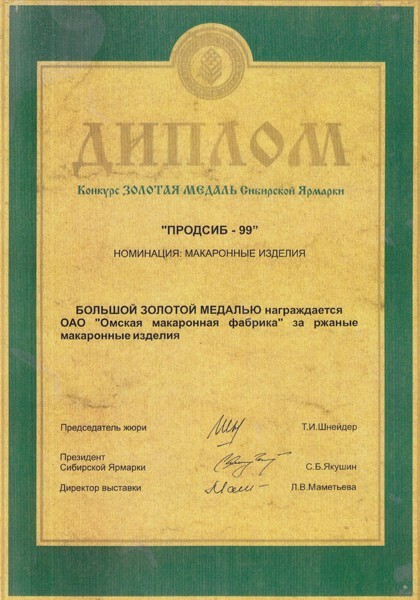 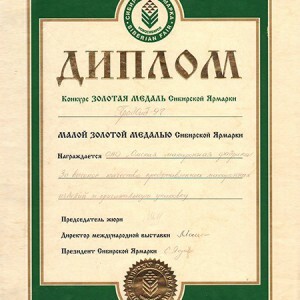 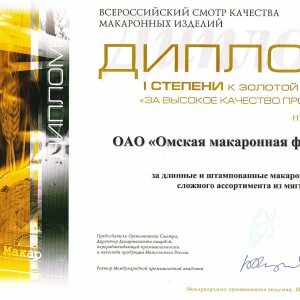 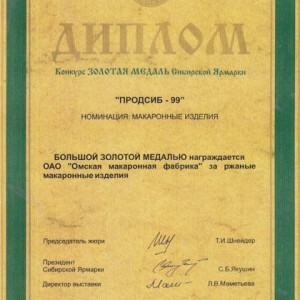 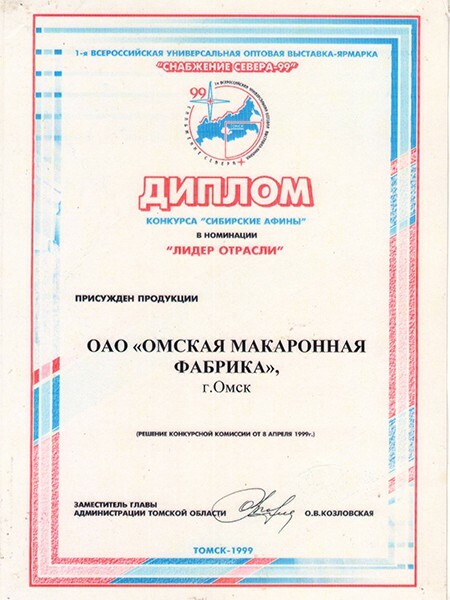 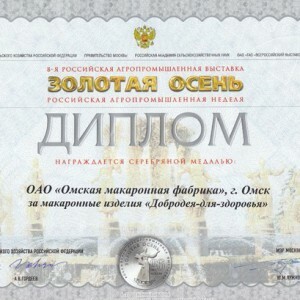 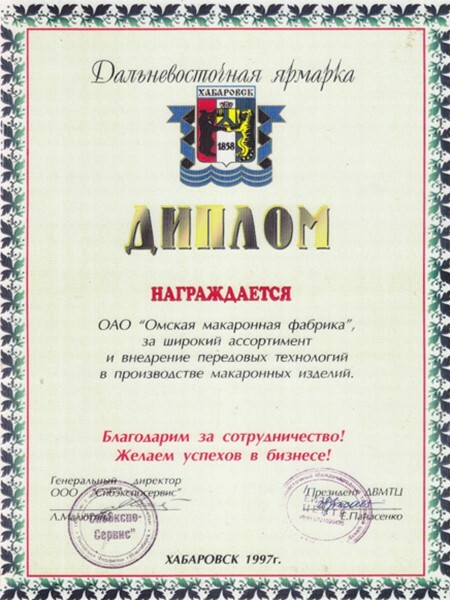 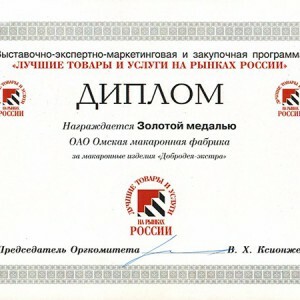 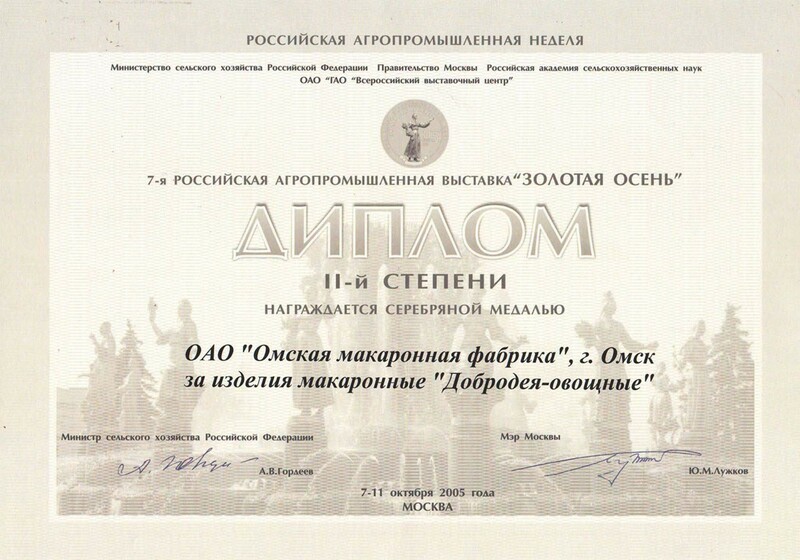 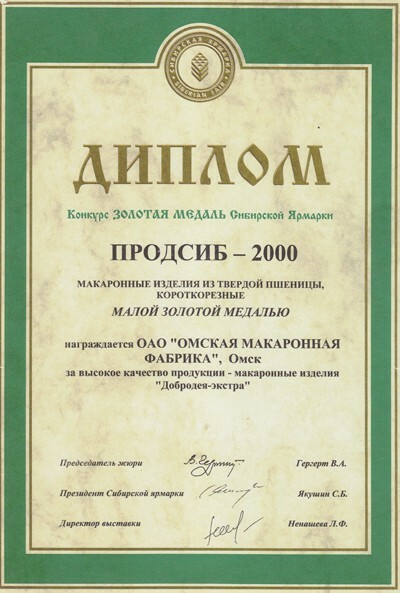 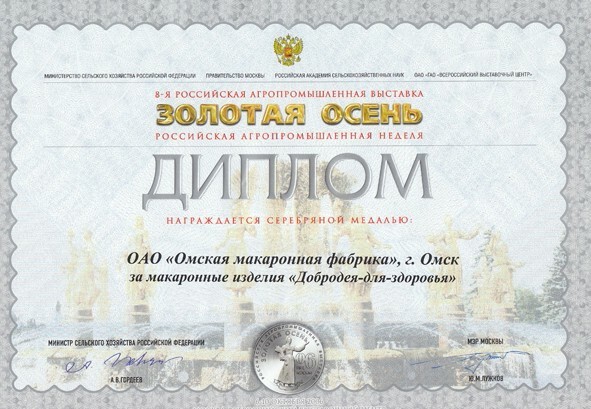 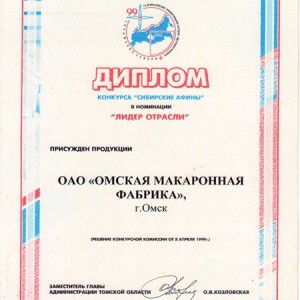 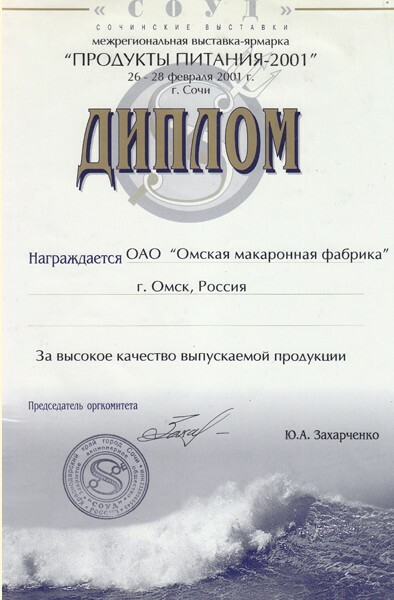 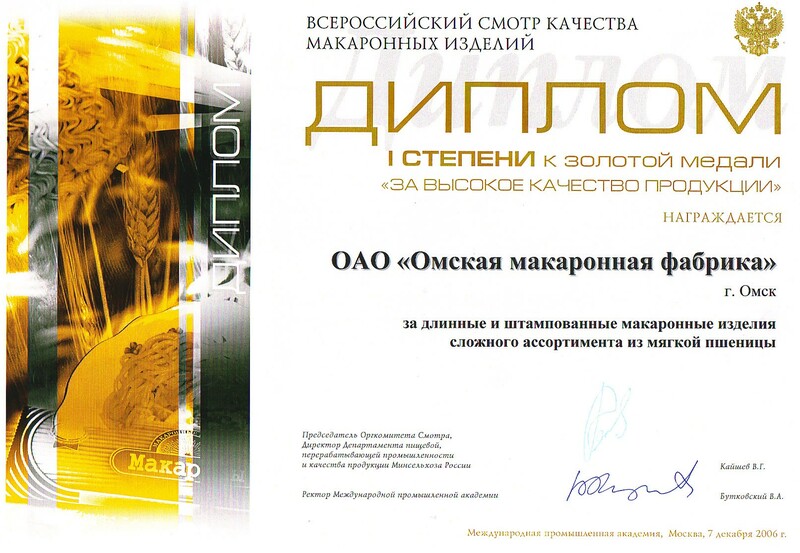 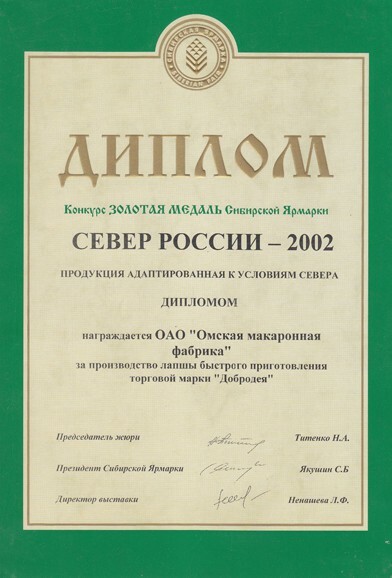 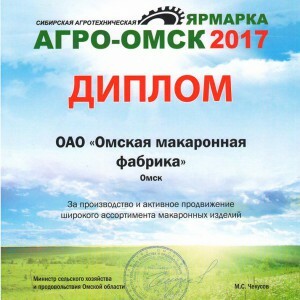 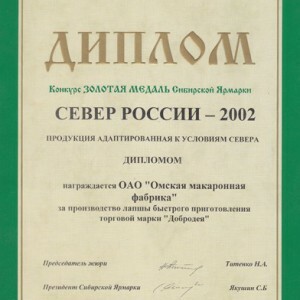 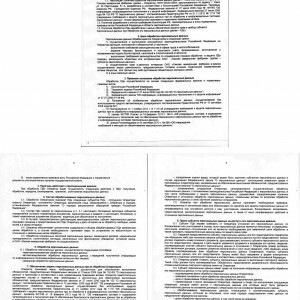 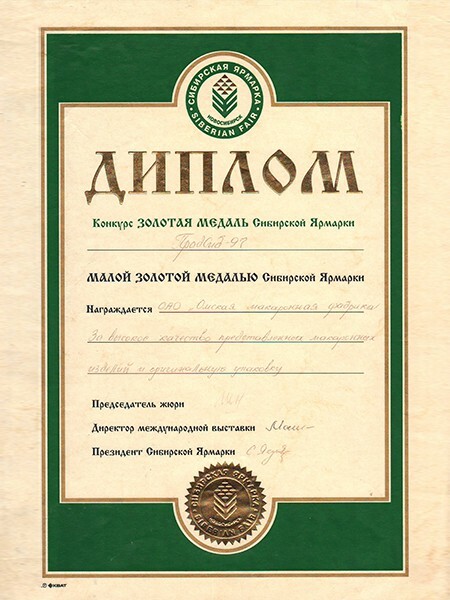 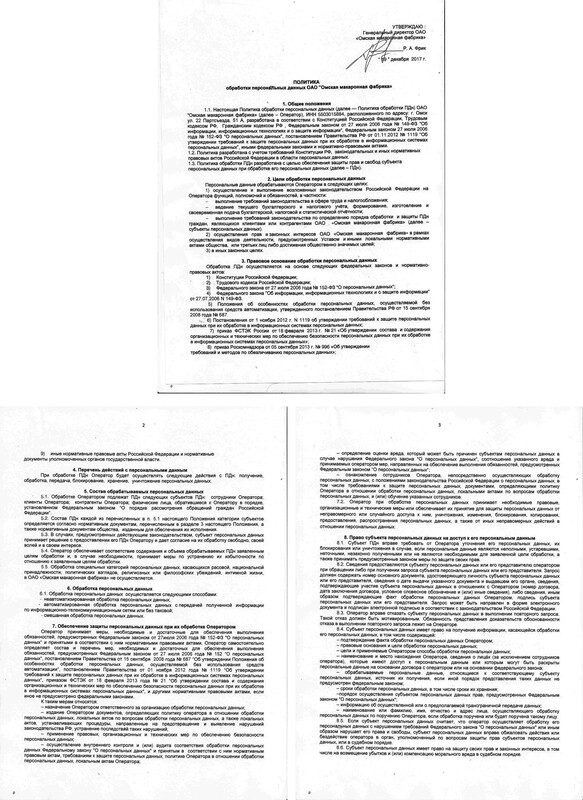 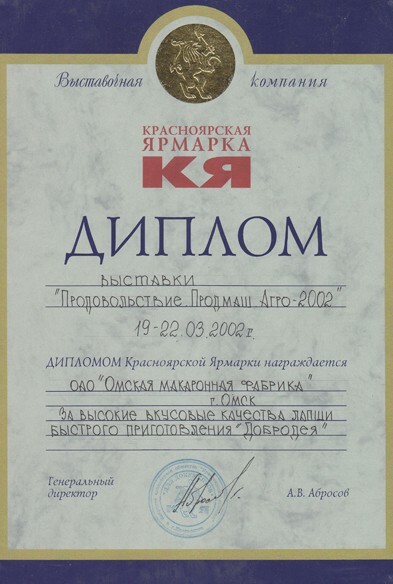 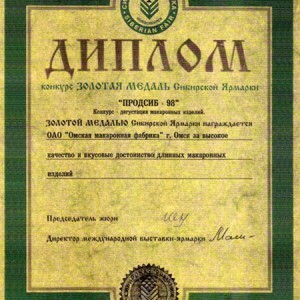 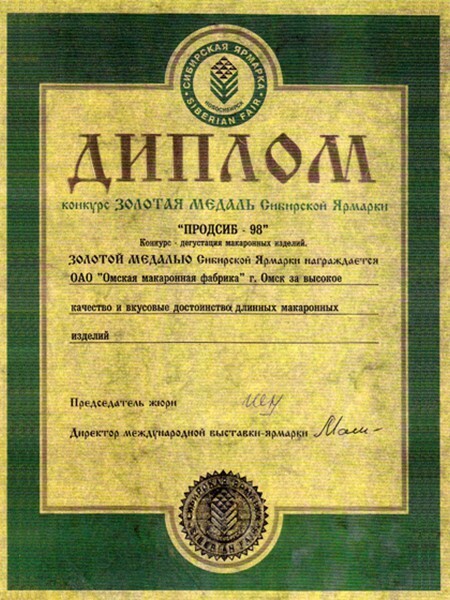 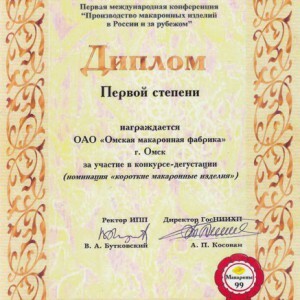 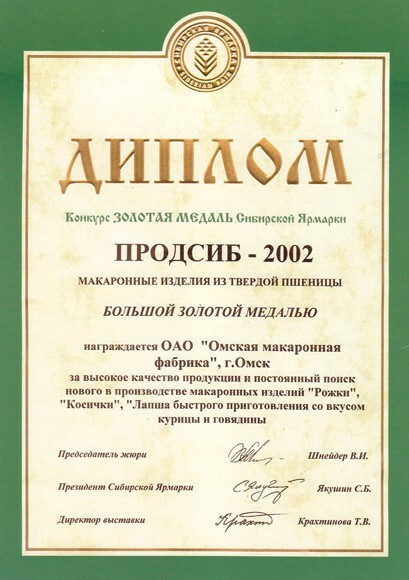 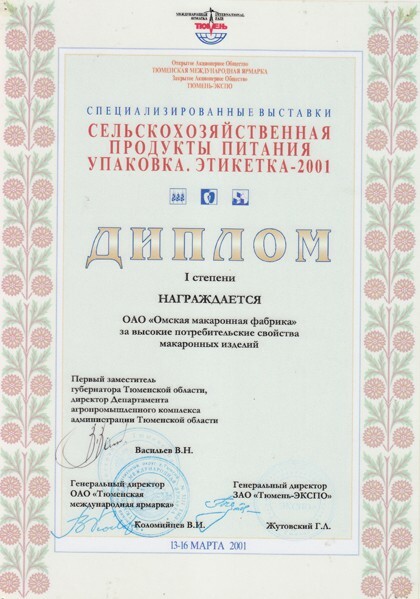 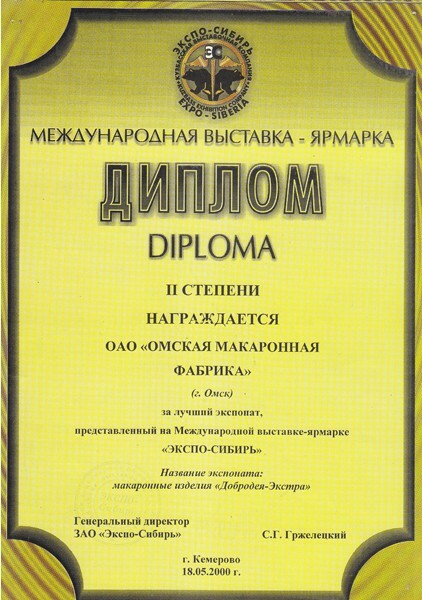 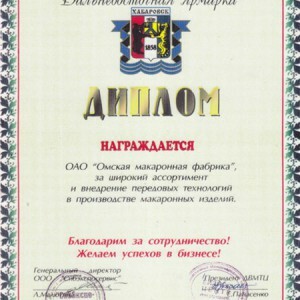 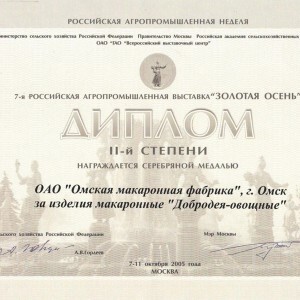 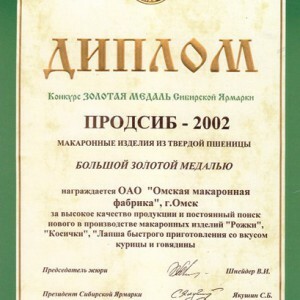 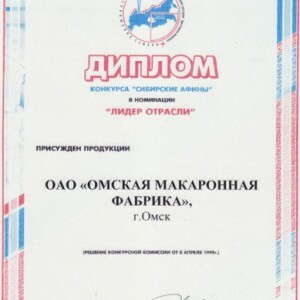 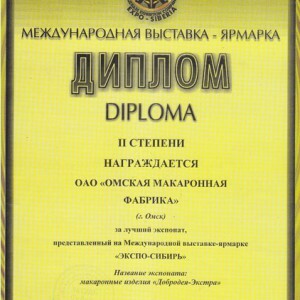 Diploma for production and active promotion of the wide range of alimentary products at the Siberian Agro-Technical Fair «AGRO-OMSK 2011». 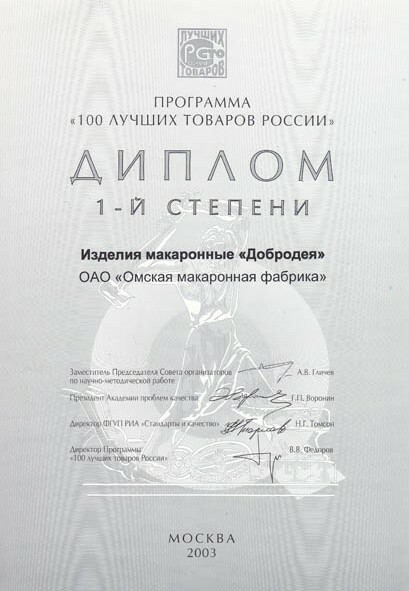 LAUREATE title at the All-Russian Competition “100 best products of Russia” for alimentary products “Dobrodeya”: macaroni specialties, vermicelli, macaroni, noodles. 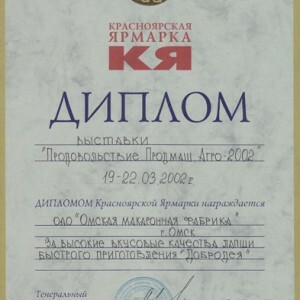 GOLD MEDAL of LAUREATE at the International Competition «BEST PRODUCT 2012» for the group A alimentary products with tomato and spinach, rigatones and macaroni «Palermo» with rough surface. 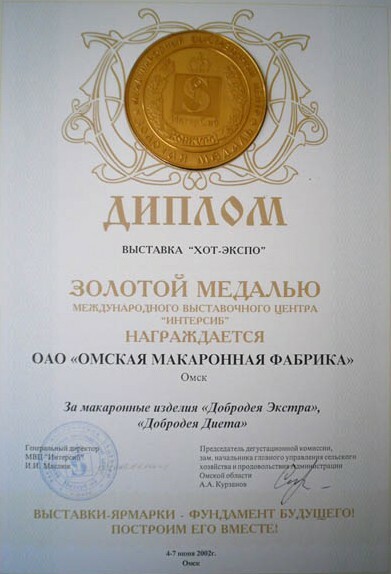 GOLD MEDAL of LAUREATE at the International Competition «BEST PRODUCT 2013» for the group A alimentary products with tomato and spinach. 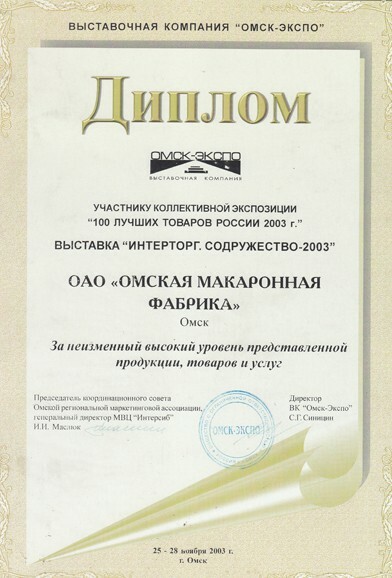 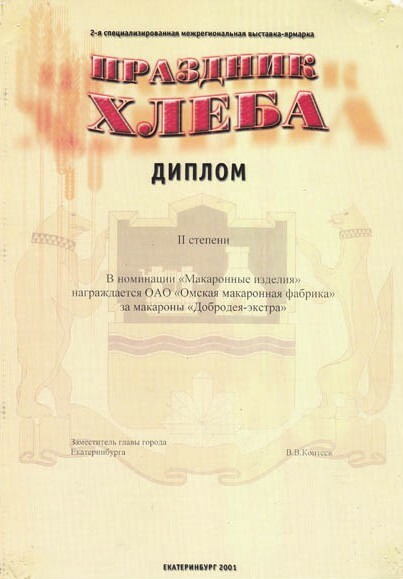 LAUREATE title at the All-Russian Competition «100 best products of Russia» for the short-cut, long-cut, pressed alimentary products «DOBRODEYA». 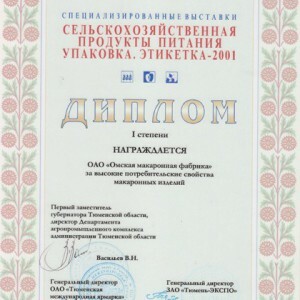 DIPLOMA WINNER title at the All-Russian Competition “100 best products of Russia” for alimentary products “Dobrodeya – Vegetable” with tomato and spinach. 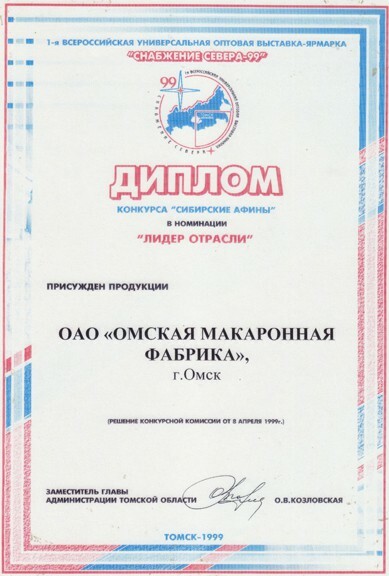 First place in the nomination of “BEST BRAND OF ALIMENTARY PRODUCTS ACCORDING TO THE OMSK CITIZENS” – DOBRODEYA. 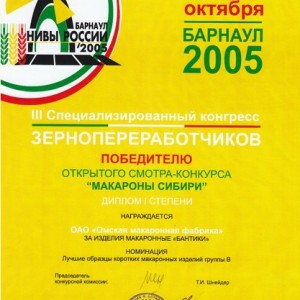 LAUREATE title at the All-Russian Competition «100 best products of Russia» for the high-grade and first-grade baker’s wheat flour “Dobrodeya”. 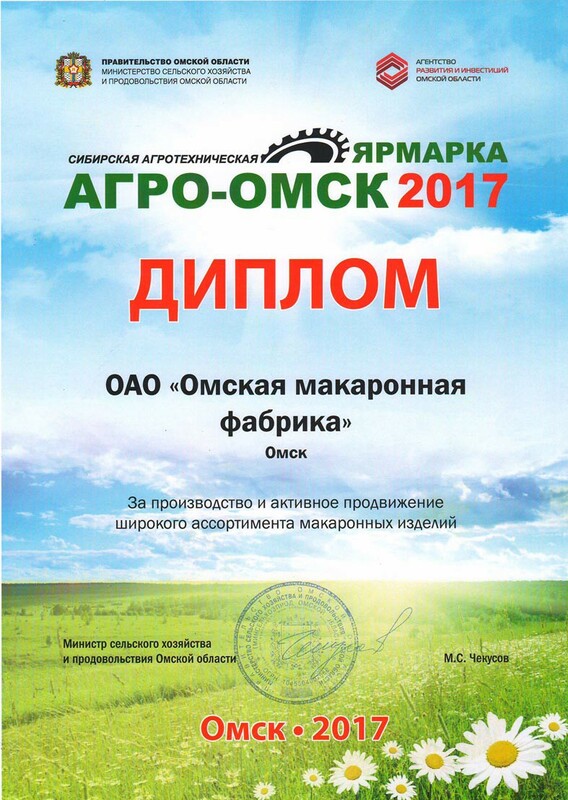 Diploma for production and active promotion of the wide range of alimentary products at the Siberian Agro-Technical Fair «AGRO-OMSK 2017».